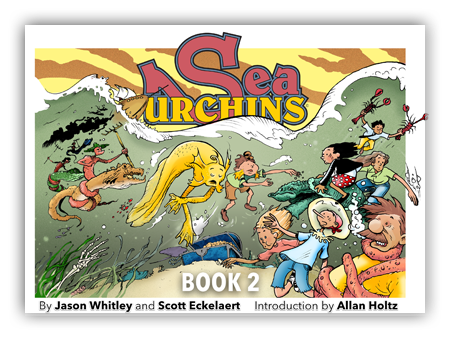 Sea Urchins Book III launches from Malaprop's Bookstore Café at 3pm, September 10, 2017. Or buy Book one at Atomic Empire! Or buy Book two at Atomic Empire! Olie Unrun always wanted to live a life at sea. Instead, he worked at his dad's fish-oil factory and began the life of a family man. One day something in Olie snapped and he built a ship on his land... then he relocated his house to the deck of the ship and christened the whole shebang "The Banana Moon." All Olie had to do was wait for the right storm to lift his house to the sea. 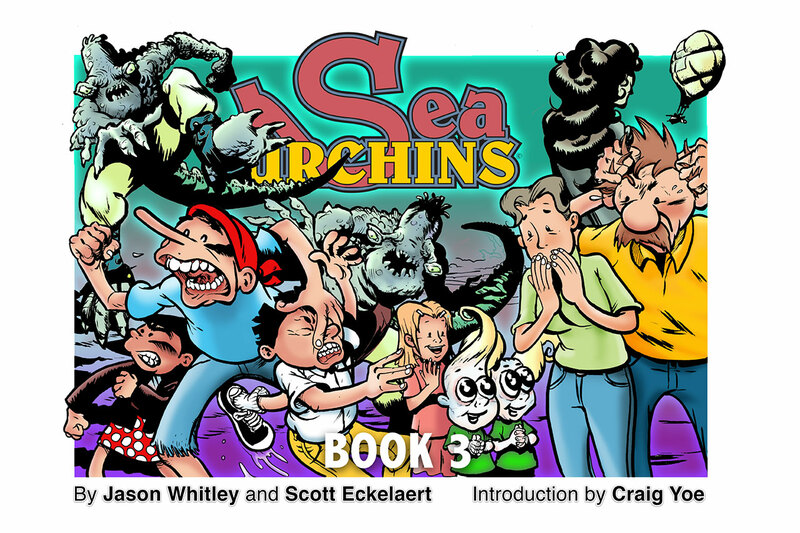 Scott Eckelaert planted the idea for a comic strip by sending Jason Whitley a copy of Hogan's Alley Magazine after Jason had just begun working at The [Myrtle Beach] Sun News in 1999. Sea Urchins bubbled up during that summer. Part of the landscape between Myrtle Beach and Sumter, SC, was boat building in people's yards. So sprang the story of Olie and the Unrun Urchins. Between the good graces of the editor, Trisha O'Connor, the work of Features Editor Mike Morgan, and guidance of Denny Brack and Tom Heintjes, we were published first in the Sun News in 2001 and then in Penn State Blue in 2003 by editor Bob Heisse. The first year of strips was collected in 2002 by David Allen's legendary Plan 9 Publishing. 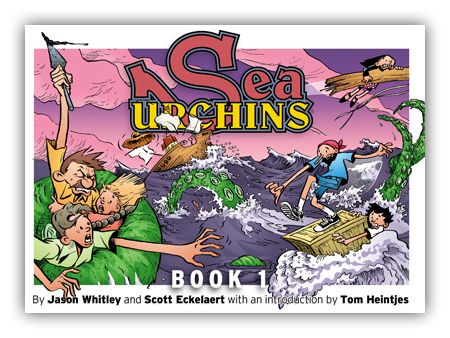 Sea Urchins was also featured as an Undiscovered Gem in Heintjes' Hogan's Alley magazine in 2003.